That’s my oldest daughter Isabella, she took a day off to go to University with my wife Tash. 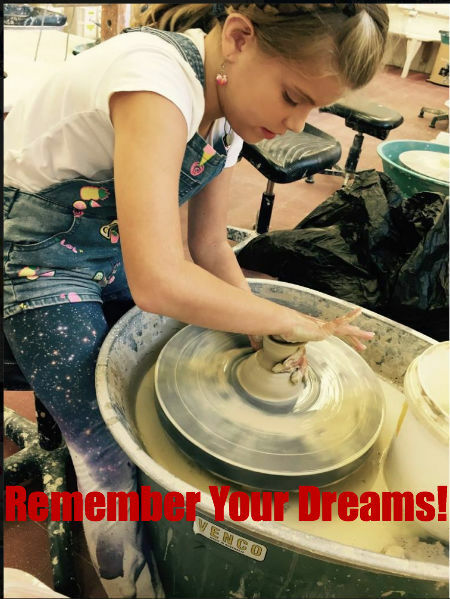 Tash is studying ceramics at National Art School, she’s following her dreams, but it wasn’t always that way. Tash always wanted to be an artist, she dreamed about it as a kid and declared to the world at 8 she was going to be an artist. But her parents told her she’d never make any money as an artist and she should do something that would make her a steady income…. Her dad wanted her to be an accountant. Her mum suggested she get an office job. Parental pressure can be tough right? She started a job working for someone who wanted her to always give more and whenever she did it wasn’t enough and nor was it good enough. She was depressed, she stopped taking care of herself, the stress was visible , her hair started to fall out. It was a major driving force for me to replace her income with a business, at first I was terrible. I made so many mistakes and screwed up on a daily basis. We lived in a cockroach infested studio apartment, at night the bed bugs feasted on us. But I knew if I kept at it, I’d get better. She freaked out and said “are you sure?” and I was sure. We had lunch and she’s never looked back. Now she’s following her dreams, she’s an artist and sells her products online. But you know what, she’s never been happier. That feels good, know what I mean? If you’re struggling then I want to do the same for you. Take a look at my Aussie Online Entrepreneurs, it’s $77 a month. I’ve made it ludicrously cheap so that it won’t hold you back from believing in yourself again. In it you’ll learn how to start the best business I know, an Amazon business. That’s brilliant Neil thanks for sharing this! Are we going to get this in the members area? Great post Neil thanks for this you are the Alibaba Entrepreneur! Jacinta my own life suggests that you can! Go for it! Lets Take back our lives!